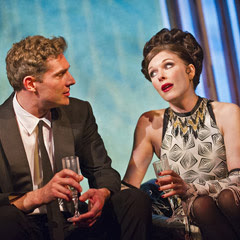 57% off London's 5 star musical, Merrily We Roll Along. Seats from £12.50. No booking fees! Includes weekend performances. With more 5 stars than any other show in West End history, this record-breaking musical is not to be missed! Book great seats starting at only £12.50 with no added fees in LOVETheatre's exclusive flash sale starting at 10am on Monday 27 May. Directed by triple Olivier Award winner Maria Friedman, Stephen Sondheim and George Furth’s musical charts the turbulent relationship between three friends over three decades. Starting in 1980 and travelling backwards in time, this powerful and moving story features some of Sondheim’s most beautiful songs including Good Thing Going, Not a Day Goes By and Old Friends. Best seats at £29.45 (usually £68.50), Upper Circle at £22.50 (usually £51.80) & Balcony at £12.50 (usually £23), all performances from 1-30 June. No booking fees. Secure tickets at LOVETheatre's exclusive prices from 10am on Mon 27 May. Book before midnight on Fri 31 May. View offer & ticket availability Rates subject to change and availability. Exclusions may apply.